My chickens have a 12×12 foot outdoor run behind my 100 year old Chicken Coop, and in the course of nearly a decade of chicken keeping I’ve experimented with various landscaping in and around the coop. In this article, I’m sharing a few of the planting methods I use to keep my chicken coop and run clean, cool, and cheerfully green. Using scrap lumber and wire mesh, I created slightly elevated platforms in my chicken run that allow the chickens to nibble green grass but prevent root damage. These boxes give young grass the protection it needs to be established in even a crowded chicken run, while providing portioned forage and entertainment for enclosed chickens. Read how to build a chicken grazing box. OAT GRASS is my favorite to plant in grazing boxes, because it will germinate and grow in cooler weather than most grasses and is cheap. Buy a 50lb bag of whole oats (NOT rolled, crimped, or processed in any way) from a feed store, and you’ll have enough seed for many rounds of grass in your coop and, as a bonus, chickens love to eat oats as scratch feed scattered outside the boxes. Spring is a great time to free range your chickens or place them in a tractor to till garden beds. Use this time of year as an opportunity to let your chicken run rest completely. After a winter of cooped chickens, by March, my run is muddy and barren, so I close off the entrance to the run and scatter grass seed. A March/April rest for my chicken run means grass seeds germinate and root undisturbed and perennial plants get to emerge from dormancy without the added stress of pecking. Depending on the number of chickens you have and how often you free range, the coop planting season can feel like an exercise in futility, however I’ve always felt like even if it’s temporary, it’s worth the aid in preventing soil erosion (and manure run-off), by encouraging seed/root growth, and providing forage and shade for my birds during the summer. By allowing the plants to a head start before exposing them to the chickens, most survive. For planting inside the coop, I choose varieties, like Sunflowers, that have tough stems that rapidly outgrow the chickens’ reach. BONUS: Sunflowers, if given a headstart, can tolerate growing inside a chicken run. Plus, planting sunflowers in April or May means having mature heads of seeds to supplement commercial chicken feed in the fall. By the end of winter, my run always looks like this. 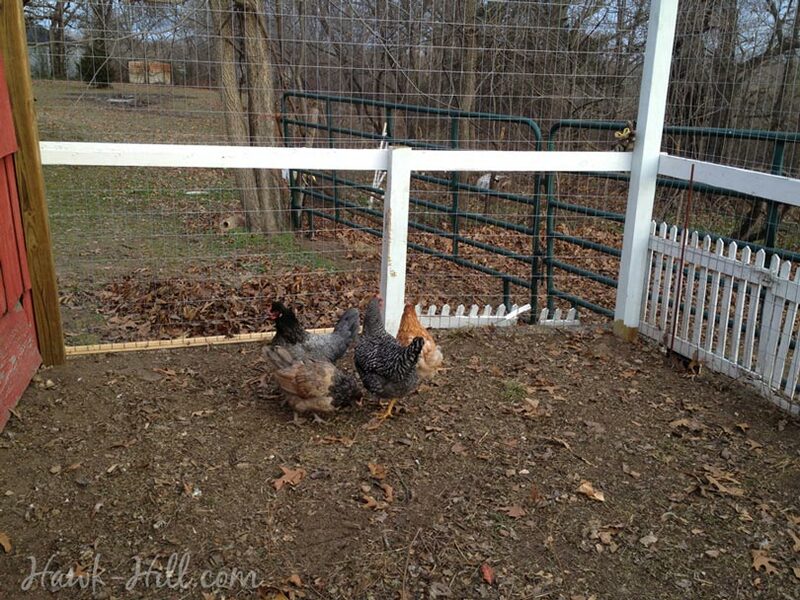 Spring is a perfect time to let your chickens free range more, while shutting off access to the run. Scatter seed and let the run rest for a few weeks. For most plants, being located in a chicken run spells doom, but there are a few plants that thrive in this environment. In southern Missouri, a Redbud Tree that I severely prune back every year in order to keep it shrub-sized is the star of my chicken run. Consider what grows naturally without tending in your climate, and has a sturdy composition? Native plants have an edge, especially in a high traffic coop. If you have nuisance plants that grow aggressively in other sections of your property, consider digging them up and transplanting to your coop. Whatever you plant, you’ll need to plan on fencing off that area for 3-6 months, to allow your perennials to get established. Although it’s a long-term commitment, the shade of a small tree or shrub established in your coop is worth it! An established shrub in your coop promotes flock health- your birds will spend the heat of summer under the shrub breathing fresh breezes rather than retreating to a stuffy coop interior. A Redbud tree, pruned to stay shrub sized, in chicken coop. 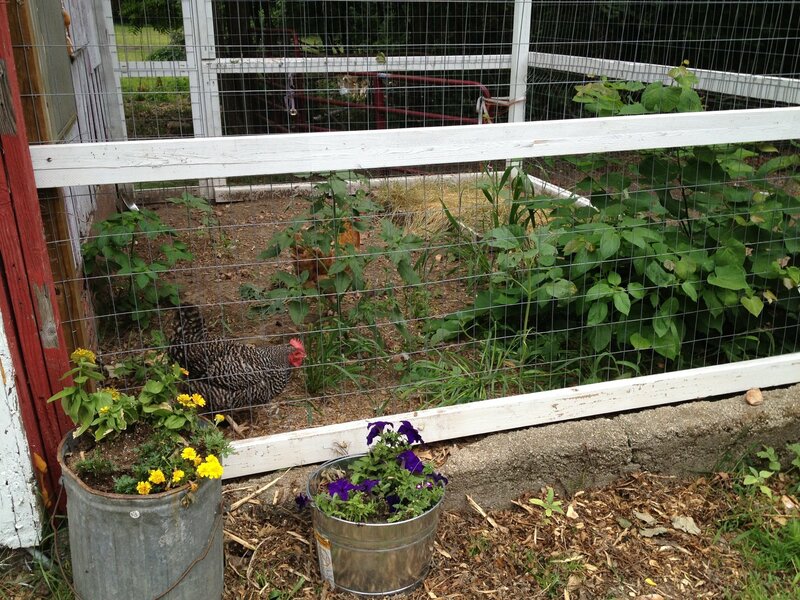 I think my most successful method to landscape my chicken run has been landscaping over and around the chicken run. Vining plants around the coop provide shade, and once the plants are established, chickens will generally leave the thick stems alone. Growing Watermelons vertically on a chicken coop has been very successful for me, and a symbiotic gardening method where the chickens fertilize the watermelon, which then shades the chickens and provides chicken food. Although the chickens can’t reach the melons growing overhead, after you’ve harvested and prepared the watermelon, chickens love the rind. Read more about using your coop as an arbor here. Use your coop as an arbor. 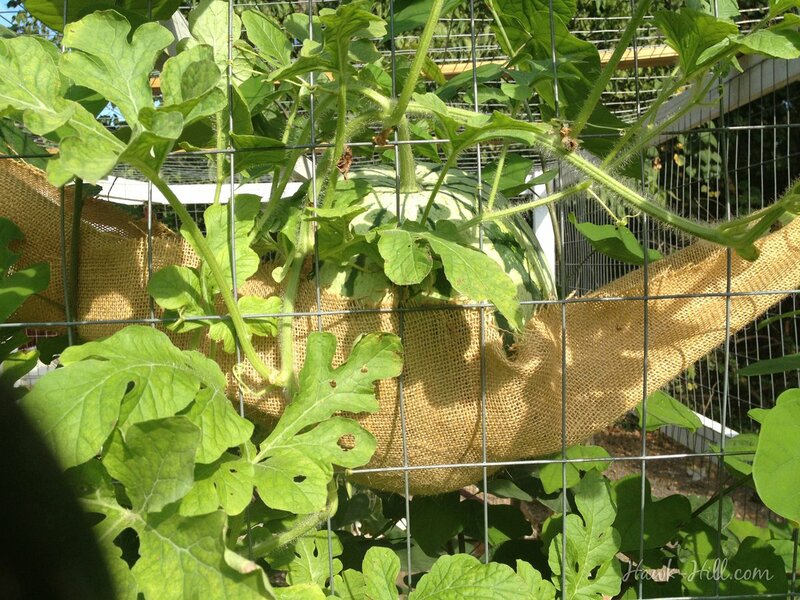 Here, watermelons grow in a sling tied over a coop. Landscaping around the outside of the run is an obvious and popular choice for making chicken runs seem less barren. It’s a great opportunity to bring color to the space and even produce your own feed supplements. Marigolds are a particularly good choice for planting around a coop- the flower heads can be fed to chickens to brighten egg yolk color (marigold petals are an ingredient in some commercial egg-layer chicken feeds, for this same reason) and the fragrance put off by marigolds deters flies and other insect pests.